As General Manager at Project LIBERTY, Jason Martin leads the initiative with passion and perseverance. While some in the industry came late to an interest in renewables, Jason Martin was marked at an early age. Growing up in northwest Montana, he watched his father — who owned a logging company in Kalispell — find alternate ways to use the waste product instead of turning to slash and burn. That mindset of conservation stayed with him. And now, as General Manager at Project LIBERTY — POET-DSM Advanced Biofuel’s commercial-scale cellulosic ethanol facility in Emmetsburg, Iowa — he’s actualizing what he dreamed about. “When I was young, I wanted to move the needle on some advancement of renewable energy. I just didn’t know what it was,” Martin says. Project LIBERTY is a joint venture between POET and the Dutch biotechnology and life sciences company DSM. In his role, Martin provides direction and vision for more than 80 team members at a project that some once thought impossible: turning corn cobs, leaves and husks into renewable biofuel. The facility has achieved a rate of 70 gallons per ton of biomass, which is near the target conversion rate, and is in a ramp-up phase. Martin’s background in chemical engineering and project management led him to POET at an opportune moment, given his vested interest in renewables. He started at POET in May 2007, shortly after POET received a grant from the U.S. Department of Energy to build a cellulose plant. He didn’t know about the grant when he applied. Martin has been involved in POET’s cellulose initiative since the project’s pilot stage. Now, his work on Project LIBERTY has come full circle, from working on the engineering of the plant, to building the plant, to most recently starting as General Manager in January 2017. Those in the industry say Martin has the dedication and tenacity needed to continue carrying out the vision that POET Founder and CEO Jeff Broin set forward for what cellulosic ethanol offers to the U.S. and the world at large. After studying chemical engineering at Montana State University, Martin knew he wanted to work in renewables instead of oil. 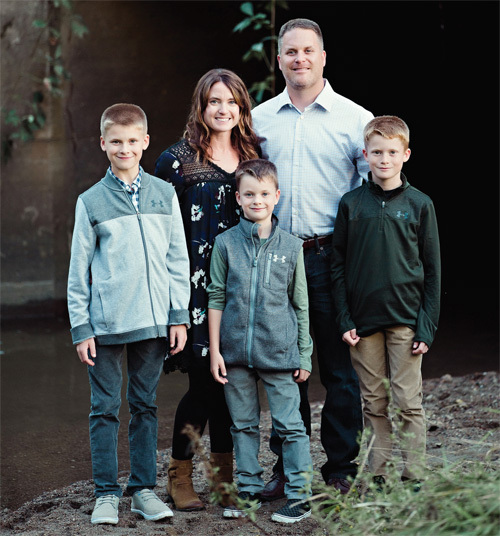 He led a best practice engineering team at Cargill for several years, but the job required international travel that was demanding on raising three boys with his wife, Cassie. The next opportunity with Cargill was to move to China, but he changed to a project management role instead that was based in Blair, Neb. When the opportunity came to work at POET, he eagerly pursued it. “I knew they were a prolific business, and U.S.-based, which I was very interested in. I went up for an interview in Sioux Falls, and the rest is history,” Martin says. POET was looking for a Project Manager for Project BELL, a pilot-scale cellulosic facility in Scotland, S.D., when he applied. “It was almost fate,” he says. Martin worked as Project Manager for Project BELL and for two other POET plants (POET Biorefining – Leipsic and POET Biorefining – North Manchester) before starting as General Manager at LIBERTY. The work at Project BELL guided the research and technology for Project LIBERTY and allowed a ramp up to commercial scale production. While cellulosic ethanol has taken a lot of turns over the last 10 years, one thing is certain: No one ever said it would be easy. The work of producing cellulosic ethanol has, most notably, been compared to putting a man on the moon. The LIBERTY team puts in many long hours working through myriad challenges that come with converting feedstock into renewable biofuel. “We’re overcoming a lot of these big material handling challenges — beefing up the machinery and making them run longer and be more robust — and we’re learning the chemistry, too, at the same time,” Martin says. That requires a strength and resilience that’s as tough as the biomass they’re working with. “The characteristics of our team at LIBERTY — they’re dynamic and they’re tough. They’re pioneers in a new industry,” Martin says. “Here you have many ups and downs. You need a group of people who can handle that — from the top down — and tackle the daily challenges we have here and continue striving to make this place better,” says Chris Hartman, Lab Manager for Project LIBERTY. The 84 team members at LIBERTY include administrative staff and a plant manager, lab manager, controller, biomass manager and maintenance manager, along with their respective teams. LIBERTY also has its own engineering team and five system engineers. “We run lean and have highly capable people. POET is a real concentration of dedicated, driven, talented people,” Martin says. As General Manager, Martin’s concern is for the overall health of the team. He’s also focused on operational excellence. “Jason’s extremely keen on keeping safety as his top priority. He’s very in tune with being organized, strong communication and relationships – not just with the management team but with everyone,” Hartman says. Martin sees his role as helping team members, both with large and small issues. On a recent day at the plant, Martin left around the noon hour to help a team member change a flat tire. It’s just one example of how Martin goes above and beyond. As with many other team members, Martin has made sacrifices for the project. His family is living in Sioux Falls until the end of the school year. Martin has been staying near the plant in Emmetsburg during the week to be more readily available to manage LIBERTY. His wife, Cassie, who is a photographer, has been handling all of their sons’ activities at home in Sioux Falls during the week. “She’s the rock of the family,” he says. But his family understands the reason behind his commitment, he says. Martin and his family will soon be moving to northwest Iowa to be closer to the LIBERTY facility. Jeff Heikes, Vice President of Project Management – Engineering, POET Design and Construction, worked with Martin on the cellulosic platform for nearly 10 years. Heikes never had to question Martin’s actions because of his commitment to the project. “It led him to go above and beyond what a lot of people did. … If it meant working the weekend shift, he would do it. … He would self-elect to do those things. It wasn’t to gain stature; it was his passion to make it happen,” he says. “Jason isn’t doing it for himself. He’s doing it for the cellulosic ethanol platform — the opportunities it has for POET and the country. It’s not what’s good for Jason. It’s what’s good for cellulosic opportunity,” Heikes says. For Martin, when looking at the tough road ahead, he’s further strengthened in his resolve to drive more efficient production at LIBERTY to pave the way for the future. The vision keeps him going. The passion and perseverance that come from a lifelong pursuit of moving the needle on renewables? That helps too.